During my senior year of high school I participated in a talent show. Based on the idea of the then popular Gong Show we had teachers as the judging panel who would strike a gong for any act they didn't like. I don't really think they actually gonged anyone. This was the second year for this event. The previous year four friends and I had made fairly elaborate KISS costumes and got up and lip-synched two or three songs to a crowd of our fellow students who played the part of crazed fans. This was to be the closest to being a Rock Star I would ever come. 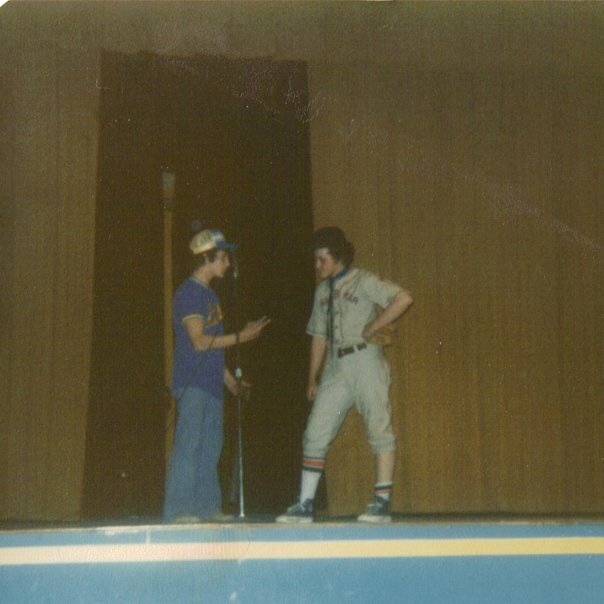 For my senior Gong Show my friend Richard and I memorized the entirety of the Abbott and Costello Who's On First Routine. I'm pretty sure there were lots of people who got very tired of hearing us rehearse. We didn't win the contest, but we pulled the routine off without a hitch. The problem that night was that we didn't really have enough acts signed up to fill the allotted time. At show time those of us who were organizing the event were scrambling to figure something out. Richard and I did a spur of the moment lip-synch to the Blues Brothers version of Shout. With fedoras and sunglasses in place I pretended to know the words while Rich did the Dan Ackroyd gymnastic moves on stage. We closed the show by lip-synching a couple of Cheap Trick songs. I had only recently gotten into them thanks to my friend Howard (see my previous post). My only awareness of Cheap Trick prior to this was from a magazine article that had lumped them into the Punk movement. I was pretty resistant to this at the time, so when he played the Heaven Tonight album I can't say I was looking forward to hearing it. The album opens with the song Surrender and I was hooked immediately. That song is the anthem of my senior year. I had only seen pictures of them at the time, so I'm sure our “performance” at the Gong Show didn't really do their live act justice. But Rich stood behind the mic as Robin Zander (he too was short and blonde) and tried to hide the fact he didn't know the words. I pulled my pants up to flood level, put on a sweater and a baseball cap and did the best Rick Neilson impersonation I could at the time. Like the previous year the crowd dutifully played their part as fans, though with slightly less enthusiasm. Cheap Trick weren't as well known as KISS. We did three songs. The show must have been running really short for this to be tolerated, but the crowd did keep cheering for more. I'm pretty sure we only planned two but got the go ahead from the panel. We did Surrender, of course, followed by I Want You to Want Me which was starting to get some radio play thanks to the At Budokan album. The extra song that ended the evening was California Man, which for some reason was one of my favorite songs on the album at the time. Looking back this was kind strange considering it would be another twenty years before I actually set foot in California. This all came crashing back into my memory last week when I heard them do California Man less than twenty-four hours after I returned from a trip to California. This was the third time I saw Cheap Trick. Once a decade seems to be the pattern. I first saw them on the All Shook Up tour on February 16, 1981 at the Pittsburgh Civic Arena. UFO opened. This was when they were still able to fill arenas. I drove into the city with my friend Greg and we sat in the nosebleed section. If memory serves, bass player Tom Peterson was not with them on this tour. The second time was on July 27, 2000 at the I.C. Light Ampitheatre as part of the Pittsburgh WingFest. I think it cost $5 to get in and eat hot wings, and oh yeah, see Cheap Trick. Nash Cato of Urge Overkill opened. 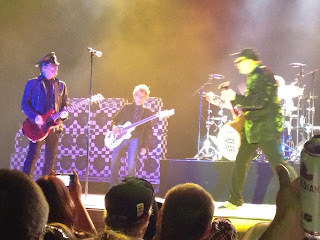 Last Wednesday they played the slightly larger outdoor venue at Stage AE with Freddy Nelson as the opening act. I understand attendance was low (http://www.post-gazette.com/stories/ae/music-reviews/low-turnout-misses-high-volume-high-energy-of-cheap-trick-700368/). Ain't that a shame, because they put on an amazing show. One of the highlights came during Need Your Love when they were accompanied by the perennial Pittsburgh fireworks display from Heinz Field. The climax of the coincidental light show lined up perfectly with the high energy final msuical break of the song. The amusement of the band at this synchrony was plain on their faces. They dug really deep into their archives for a high energy Rock and Glam Metal show. Part of their appeal is that they have always crossed the boundaries of musical styles. I first heard of them in an article on Punk, though they have never really been part of that scene (like The Runaways, who they toured with a lot in the 70's, they were lumped into that category simply because of the time period and the venues they were playing in). They can play convincing hard rocking tracks and then follow up with the unapologetically bubblegum of I Want You To Want Me. They do it all with a nod and a wink and a sense of humor that borders on the camp but never lets you forget they're a rock band. The shared nostalgia I mentioned in my previous post was true here as well. In 1979 I was the only real Cheap Trick fan at my small high school. Richard didn't really know the songs when I talked him into his Gong Show performance as Robin Zander. I Want You To Want Me was getting some traction on the radio but most of my hard rock friends thought it sounded silly and the disco fans had no time for it at all. But Heaven Tonight is one of the seminal albums of 1979 for me. Then, Surrender was My song. Just hearing the intro brings back a flood of memories and makes me feel like a teen again (the same is true of the intros to Rebel Rebel and School's Out). But thirty-four years later I find myself in a crowd of screaming fans, all of us singing along, just seeming a little weird. It wasn't just My song. It belonged to all of us who loved it, and we all have the same kind of stories and memories encoded in its sound. Disparate lives and experiences give way to harmony as we sing our song. It's all alright. It's all alright.